The Ramsey County Board of Commissioners has directed staff to begin negotiations on an exclusive six-month agreement with AECOM to perform due diligence on a proposal to develop the Riverfront Properties site in downtown Saint Paul. The proposed development centers around connecting downtown residents, workers and visitors to the Mississippi River. A land bridge extension over Shepard Road and the railway, extending downtown Saint Paul to the Mississippi River and essentially doubling the developable area of the site, which was previously independently estimated to accommodate $150 million in private development. Phased construction of four towers with Class A office and residential space and street-level retail, entertainment and hospitality. 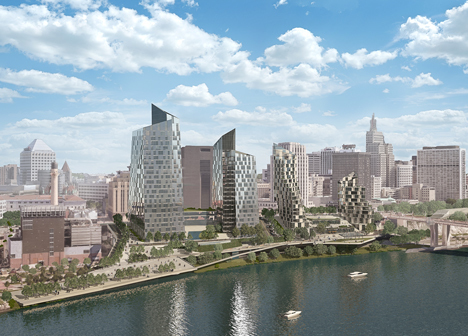 Integrated public spaces including the first leg of the city’s proposed River Balcony, a river-level esplanade, and amphitheater and bandshell overlooking the river. New roadway connections to the site and supplemental parking. The first phase of the project contemplates the construction of an amphitheater, residential and hotel spaces, and a skybridge connecting Kellogg Mall Park to the river. Up to 350 Class A apartment units, 150 condo units, and 250 hotel rooms could be built during this phase, along with 600 parking stalls and roughly 20,000 square feet of retail and restaurant space. "When people decide to start their business, plant their roots, and live out their dreams in Saint Paul – our downtown vitality, access to riverfront amenities, culture and entertainment are all factors that matter," said Saint Paul Mayor Melvin Carter. "The vision for this development captures the exciting potential of Saint Paul as a river city." Ramsey County and AECOM will enter into a six-month agreement to allow both entities to complete due diligence on the site. The agreement will require the development to meet multiple benchmarks, including meeting with project stakeholders and determining matters such as project market feasibility, phasing, financing, and height variances. The findings of this six-month due diligence process will determine whether the county and AECOM enter into a formal development agreement for the project. Headquartered in California, AECOM is a fully integrated, infrastructure firm well known for its work on public sector projects around the globe. The firm’s portfolio includes projects such as master planning for the 2012 Olympic Games in London as well as the 2028 Olympic Games coming to Los Angeles, and the Gordie Howe International Bridge, one of the largest P3 projects in North America, for which AECOM is the lead design firm also providing geotechnical and environmental consulting support. Over the next few weeks, the county’s project team and AECOM will finalize the terms of the agreement, which will then go to the Board of Commissioners for approval. Posted on Tuesday, November 20, 2018 - 2:54 p.m.